The latest video game to fall into Hollywood's clutches is Ubisoft's Assassin's Creed, a stealth adventure that has so far clocked up nine main games and a colossal 17 spin-offs. With Ubisoft very much involved in the film, you can at least credit the company with taste, recruiting promising Australian director Justin Kurzel (Snowtown) and Michael Fassbender and Marion Cotillard, who starred in his bruising version of Macbeth. 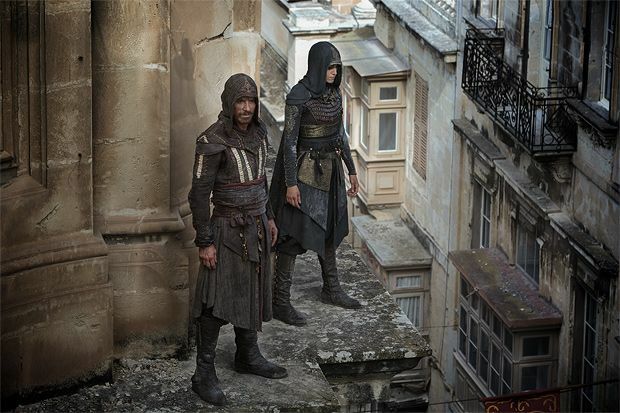 While most game-to-movies have floundered, Assassin's Creed is certainly at the higher end of the quality spectrum. Aside from the aforementioned, a supporting cast that unites Jeremy Irons, Brendan Gleeson, Charlotte Rampling and Michael Kenneth Williams is to be applauded. But, there's a distinct lack of emotion at the film's core – not helped by the fact that Fassbender's central character Callum Lynch is a rather unsympathetic murderer on Death Row. After what is supposed to be a lethal injection, Lynch wakes up in a Madrid research facility run by father-daughter boffins, Alan and Sophia Rikkin (Irons and Cotillard). His ancestor, it's revealed, is 15th century Spaniard Aguilar, a member of the Assassins brotherhood. This secret society is waging war against rivals the Knights Templar, who are pursuing the Apple of Eden, an object that contains the genetic code to man's free will – all of which will be familiar to fans of the game, even if Fassbender's new character is not. With the Rikkins also keen to get their hands on the Apple, poor old Callum is forced to ping back and forth through history, in a giant pincer-like machine, that taps into his DNA memories. Certainly, the set-pieces are spectacular and reminiscent of the game's style, but the flip-flopping between past and present means the film is never able to establish a satisfying rhythm. And with Fassbender's acting capabilities constrained by a role more physical than cerebral, Assassin's Creed flutters but never soars. General release from Sun 1 Jan.